Order Custom Branded Aromatherapy Candles – give the gift of pleasing aromatherapy scents in 8ounce tins of melon, vanilla, rose, blueberry, & apple cinnamon. 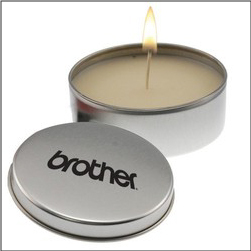 Candles can be used for any number of tradeshow or gift / giveaways for events etc. Order your clients and customers or potential clients and customers great aromatherapy candles with your logo on the tin today!